I love when I can combine a fun kids art project with upcycling or re-purposing of a common household object. For awhile there I never had enough wooden spoons so every time I hit a yard sale or thrift store I would grab one or two, well lets just say I am no longer wooden spoon challenged. 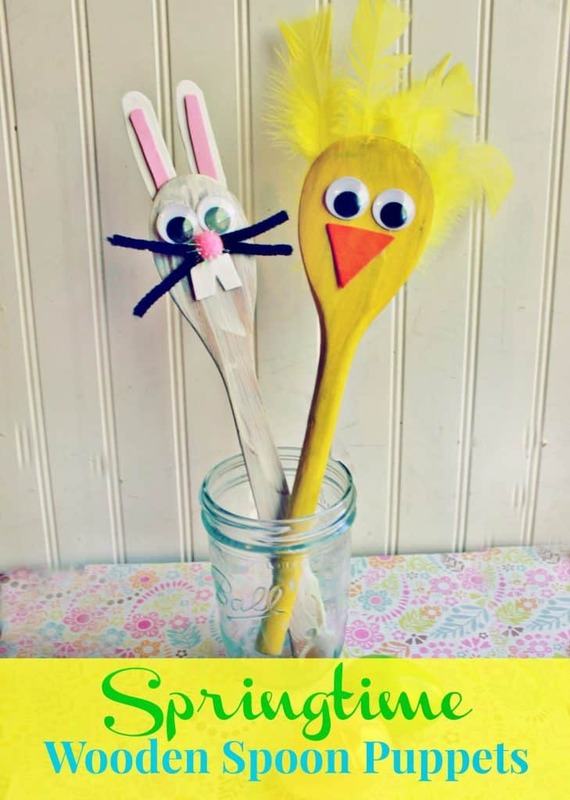 So I threw a couple in our general art supply tub (clean empty tin cans, empty toilet paper rolls, wooden spoons etc… I figured they would come in handy for something one day, and while looking for something for the kids to do I was hit with inspiration just in time for spring! 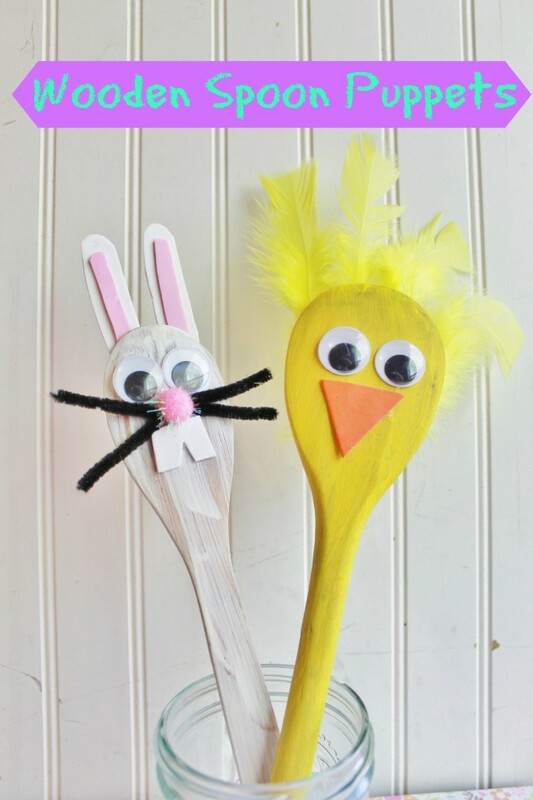 This easy spring chick and bunny wooden puppets turned out great! 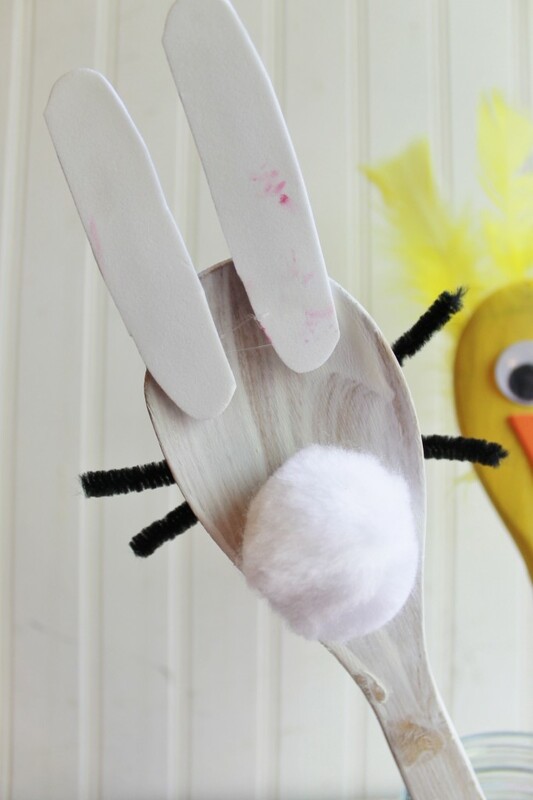 I added a few more items from our craft stash like pompoms, feathers, and googly eyes. These fun puppets were a big hit with the kids and held two part fun- first the fun of creating them, and then the playtime! Cover a cardboard box with a piece of fabric for a puppet theater and it will keep the kids busy for hours. We went with a bunny and a chick but I think we are going to create an entire barnyard full of these cute creatures. Decide with your child what animal they will make so you can help with creating parts and pieces. 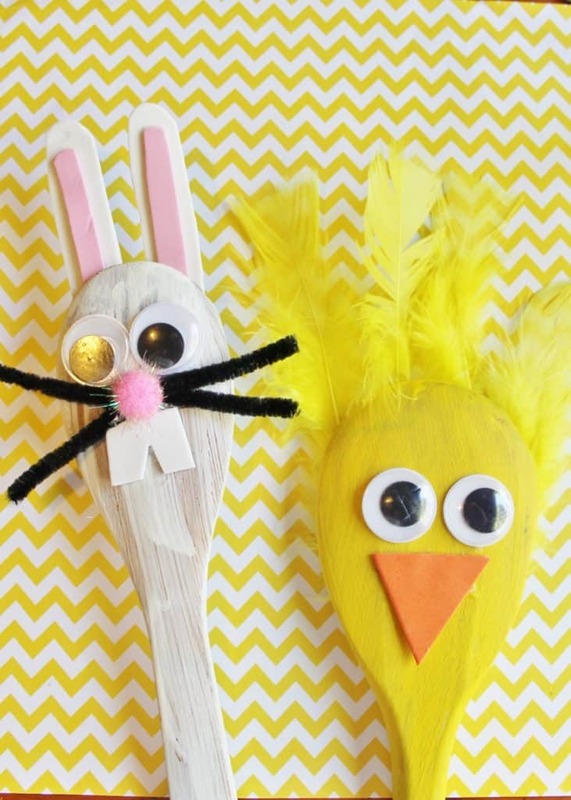 We made a bunny and a chick – great for both Easter, spring, or a farm animal theme. 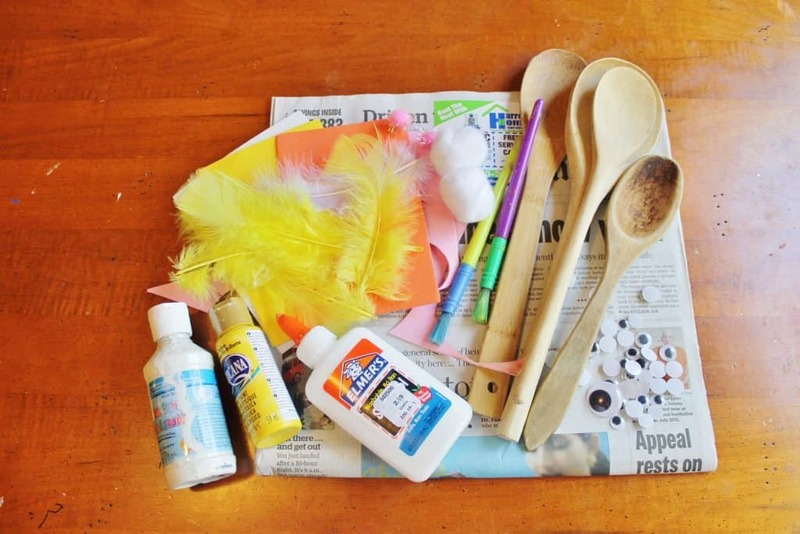 Spread out newspaper, provide your child with whatever base color of paint they need and instruct them to paint the entire spoon, place in a can or jar and allow to dry completely. Cut out a small orange triangle of craft foam for your chick puppet. 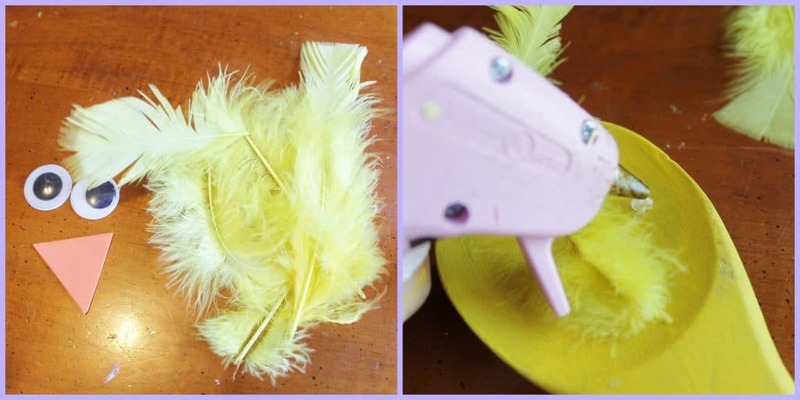 Glue on 3-5 yellow tail feathers and beak with a hot glue gun . Add your googly eyes too! Cut out features for your bunny puppet from craft foam-rabbit ears and teeth. Cut out 3” length of pipe cleaner , and bend into a “V” for whiskers. Glue on with a hot glue gun. Add your googly eyes, big silly teeth, a pink pompom nose, pipe cleaner whiskers, ears with sweet pink inside. Don’t forget a big white pompom for a cute bunny bottom. I like to use the flat part of the spoon for the animals face, and the “bowl” for the back. Hot glue sets up quickly so the kids will be ready to play in no time at all! Aren’t these adorable?! You can modify this to make any animal that you want to! Try some of these yourself and let us know what you made! Buy wooden spoons in bulk now on Amazon!